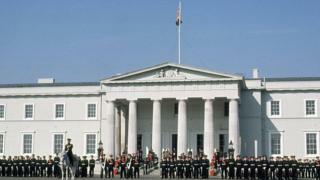 A female officer cadet who was found dead in an apparent suicide at the Royal Military Academy Sandhurst has been named as Olivia Perks. The 21-year-old was discovered in her room at the Army's officer training college in Berkshire on 6 February following a party. The cadet was thought to have been involved in a minor disciplinary incident just before her death. An inquest into Ms Perks' death is set for 26 February. Besides the incident, which is being investigated, there was no further suggestion of wrongdoing. Ms Perks, who joined the academy in May 2018, was in the last term of a 44-week course for officer cadets. It is understood Ms Perks had been spoken to after failing to return to her barracks following a weekend party on the base. At the time, a Ministry of Defence spokesman also confirmed there had been an incident at the academy which resulted in the death of an officer cadet and Thames Valley Police said they were treating the death as "unexplained but non-suspicious".